The Ziland Hybrid Water Bottle Set come with 8 easy squeeze 1 litre Ziland Hybrid water bottles and a free water bottle carrier as a gift. Designed so there is no mouth contact with the nozzle, which reduces the risk of any unhygienic infections. Manufactured with a soft plastic (BPA free) bottle making it easy to squeeze. Ideal use for any training session or match. 8 x 1 Litre/35oz Ziland Hybrid Water Bottles. 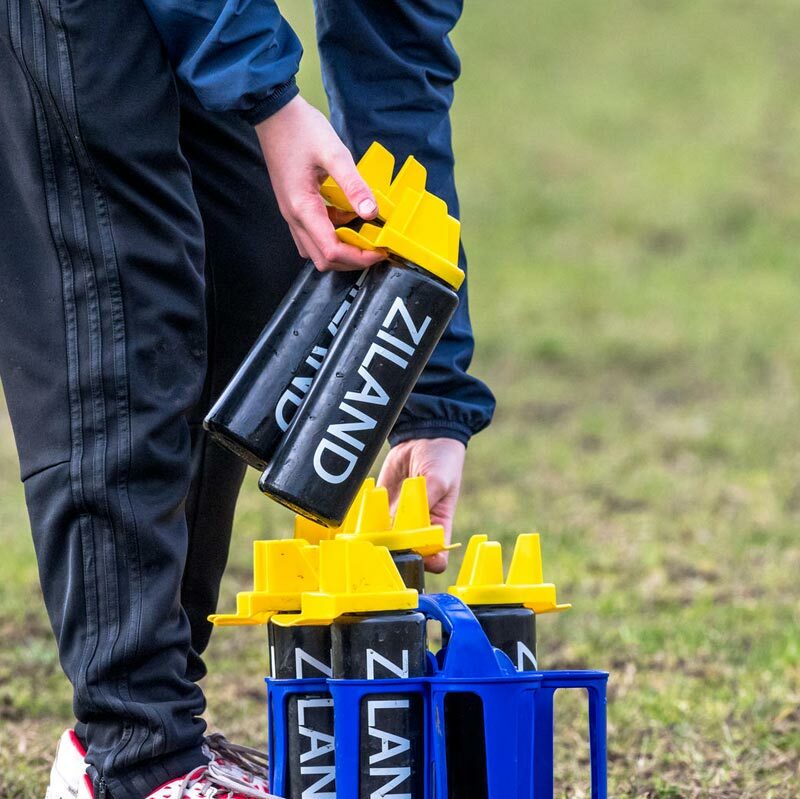 1 x Ziland bottle carrier - assorted colours. EASY SQUEEZE. Ideal for all age groups. BPA free. (BPA stands for bisphenol A. BPA is an industrial chemical that has been used to make certain plastics and resins). Hygienic way of keeping the team hydrated without spreading any germs. Longer lasting than traditional water bottles and fit nicely in the dishwasher ! Seems a solid product. Not had a season out of them yet. Very good value bottles and carrier. Great for keeping the boys hydrated and hygienic. Only down side is having to carry 8+kg to the furthest rugby pitch ?? This is the second set of these we have for our rugby club. We didn’t look at anything else as they do the job exactly how we needed. These water bottles are very good for drinking water from. They make for inadequate company of a Thursday evening in the pub, but serve their primary function more than satisfactorily. I Bought two sets of these bottles and have found them to be very sturdy, they are considerably cheaper than similar products and so far, I cannot see why. I will be buying more in the next few weeks. They do exactly what they’re supposed to.. they’re water bottles.. no complaints..
Great price, same quality as more expensive branded bottles. Quick delivery. Wash well in dishwasher. most hygienic and safe water bottles so really impressive, only one niggle is the inner tube is not very secure to the lid. Excellent. Only way to describe them. A massive hit not only with my group of players but with everyone else. Other teams are green with envy. Highly recommend them as great to use. No issues regards hygiene easy cleaned and best thing dishwasher safe. Anyone looking for water bottles these are ideal. Excellent value for money rugby boys love them ?? Have not used the product yet as season has not started. But Product seams very good with excellent delivery time and the goods seem very durable. 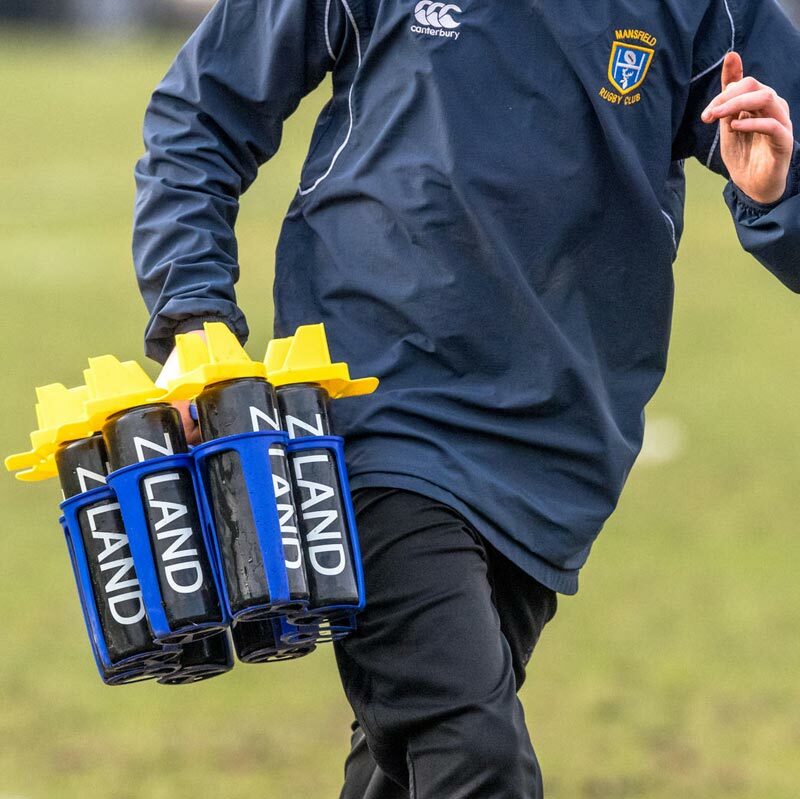 Required new water bottles for our youth rugby team and these have been a great purchase Hygienic and easy to use especially with carriers recommended for any sports team. Purchased for a ladies rugby team they do what they say on the tin. Prompt delivery. Only issue would be the sealing washer in lid falls out, just have to be wary. 5 out of 5 Great bottles! Bought these for a junior rugby team and they were spot on, other similar bottles we've had previously were too strong for the kids to squeeze but these are flexible enough for small children. Excellent piece of equipment at a very reasonable price compared to other brands. Carrier sturdy and great fit for the purpose. Could have given a better service. Delivered in 24 hours. Have used them for my u13 rugby squad. Have noticed that since we changed from standard water bottles the boys are taking on more fluid. Hopefully helps to stop the spread of coughs and colds. Had droughts on the quality due to the price but they are just as good as good as the much more expensive brands. I would recommend them to any sports team. Once my U13's figured out that they just have to "squeeze" the bottle - not take the lid off - and other interesting angles they were holding them at to get the water out, they've worked really well. So much easier to use, more compact (usually carry around two racks of bottles) and certainly more hygienic. Really well worth the purchase, would recommend them to anyone wishing to downsize the amount of kit they have to put into their car on training & match days! An excellent product,just what was required for our team. With hygiene paramount the design of the bottles works well. The I dos loved them. Just great, works well, easy to carry and use, with a really good price and the usual fast delivery from Newitts. Brilliant solution for managing the under 9 team. At half time all the players can come in for a team talk instead of going off to individual patents for their bottles. It's hygienic and it doesn't matter which bottle they pick up as they squirt the water without the need for a mouth piece. Great product at this price. Purchased in bulk for two U15 Rugby Teams. Team like them. Remind the boys they need to squeeze them. Some puzzled looks first time they were used. Amazing service as always and a great product too. Came on time, does the job, the team are no longer dehydrated at half time. My sons football team love them ! Very quick delivery and excellent value for money. Would recommend them to any team,. 5 out of 5 Awesome set! For the price I paid, this set is excellent for my son's school rugby team. Perfect in size and also in shape and easy to transport. Excellent quality price ratio. 4 out of 5 Great Idea - needs a bit of work though! Got these for our kids football team, mainly for hygiene reasons. Apart from the kids working out how to use them the main problem is the position of the chin rest. when you squeeze it doesnt hit your mouth so you have t move your mouth about a bit to get the water in. maybe after a bit of practice it will get better. but you'd think this would be the kind of thing spotted in product testing.